Aspirin is a medicine that relieves pain and reduces fever. Aspirin is used to relieve many kinds of minor aches and pains—headaches, toothaches, muscle pain, menstrual cramps, the joint pain from arthritis, and aches associated with colds and flu. Some people take aspirin daily to reduce the risk of stroke, heart attack, or other heart problems. Aspirin-also known as acetylsalicylic acid-is sold over the counter and comes in many forms, from the familiar white tablets to chewing gum and rectal suppositories. Coated, chewable, buffered, and extended release forms are available. Many other over-the-counter medicine contain aspirin. Alka-Seltzer Original Effervescent Antacid Pain Reliever, for example, contains aspirin for pain relief and sodium bicarbonate to relieve acid indigestion, heartburn, and sour stomach. Aspirin belongs to a group of drugs called salicylates. Other members of this group include sodium salicylate, choline salicylate, and magnesium salicylate. These drugs are more expensive and no more effective than aspirin. However, they are a little easier on the stomach. Aspirin is quickly absorbed into the bloodstream and provides quick and relatively long-lasting pain relief. Aspirin also reduces inflammation. Researchers believe these effects come about because aspirin blocks the production of pain-producing chemicals called prostaglandins. In addition to relieving pain and reducing inflammation, aspirin also lowers fever by acting on the part of the brain that regulates temperature. The brain then signals the blood vessels to widen, which allows heat to leave the body more quickly. TO RELIEVE PAIN OR REDUCE FEVER. One to two tablets every three to four hours, up to six times per day. TO REDUCE THE RISK OF STROKE. One tablet four times a day or two tablets twice a day. TO REDUCE THE RISK OF HEART ATTACK. Check with a physician for the proper dose and number of times per week aspirin should, if at all, be taken. Aspirin-even children's aspirin-should never be given to children or teenagers with flu-like symptoms or chickenpox. Aspirin can cause Reye's syndrome, a life-threatening condition that affects the nervous system and liver. As many as 30% of children and teenagers who develop Reye's syndrome die. Those who survive may have permanent brain damage. Check with a physician before giving aspirin to a child under 12 years for arthritis, rheumatism, or any condition that requires long-term use of the drug. No one should take aspirin for more than 10 days in a row unless told to do so by a physician. Anyone with fever should not take aspirin for more than 3 days without a physician's consent. Do not to take more than the recommended daily dosage. Diuretic — Medicine that increases the amount of urine produced and relieves excess fluid buildup in body tissues. Diuretics may be used in treating high blood pressure, lung disease, premenstrual syndrome, and other conditions. Inflammation — Pain, redness, swelling, and heat that usually develop in response to injury or illness. NSAIDs — Nonsteroidal anti-inflammatory drugs. Drugs such as ketoprofen and ibuprofen which relieve pain and reduce inflammation. Polyp — A lump of tissue protruding from the lining of an organ, such as the nose, bladder, or intestine. Polyps can sometimes block the passages in which they are found. Prostaglandin — A hormonelike chemical produced in the body. Prostaglandins have a wide variety of effects, and may be responsible for the production of some types of pain and inflammation. Reye's syndrome — A life-threatening disease that affects the liver and the brain and sometimes occurs after a viral infection, such as flu or chickenpox. Children or teenagers who are given aspirin for flu or chickenpox are at increased risk of developing Reye's syndrome. Rhinitis — Inflammation of the membranes inside the nose. Salicylates — A group of drugs that includes aspirin and related compounds. Salicylates are used to relieve pain, reduce inflammation, and lower fever. Pregnant women. Aspirin can cause bleeding problems in both the mother and the developing fetus. Aspirin can also cause the infant's weight to be too low at birth. Women who are breastfeeding. Aspirin can pass into breast milk and may affect the baby. People with a history of bleeding problems. People who are taking blood-thinning drugs, such as warfarin (Coumadin). People with a history of ulcers. People with a history of asthma, nasal polyps, or both. These people are more likely to be allergic to aspirin. People who are allergic to fenoprofen, ibuprofen, indomethacin, ketoprofen, meclofenamate sodium, naproxen, sulindac, tolmetin, or the orange foodcoloring tartrazine. They may also be allergic to aspirin. People with AIDS or AIDS-related complex who are taking AZT (zidovudine). Aspirin can increase the risk of bleeding in these patients. People taking certain other drugs (discussed in Interactions). People with liver damage or severe kidney failure. Aspirin should not be taken before surgery, as it can increase the risk of excessive bleeding. Anyone who is scheduled for surgery should check with his or her surgeon to find out how long before surgery to avoid taking aspirin. Aspirin can cause stomach irritation. To reduce the likelihood of that problem, take aspirin with food or milk or drink a full 8-oz glass of water with it. Taking coated or buffered aspirin can also help. Be aware that drinking alcohol can make the stomach irritation worse. Do not take aspirin that has a vinegary smell. That is a sign that the aspirin is too old and ineffective. Flush such aspirin down the toilet. Because aspirin can increase the risk of excessive bleeding, do not take aspirin daily over long periods-to reduce the risk of stroke or heart attack, for example-unless advised to do so by a physician. The most common side effects include stomachache, heartburn, loss of appetite, and small amounts of blood in stools. Less common side effects are rashes, hives, fever, vision problems, liver damage, thirst, stomach ulcers, and bleeding. People who are allergic to aspirin or those who have asthma, rhinitis, or polyps in the nose may have trouble breathing after taking aspirin. Aspirin may increase, decrease, or change the effects of many drugs. Aspirin can make drugs such as methotrexate (Rheumatrex) and valproic acid (Depakote, Depakene) more toxic. If taken with blood-thinning drugs, such as warfarin (Coumadin) and dicumarol, aspirin can increase the risk of excessive bleeding. Aspirin counteracts the effects of other drugs, such as angiotensin-converting enzyme (ACE) inhibitors and beta blockers, which lower blood pressure, and medicines used to treat gout (probenecid and sulfinpyrazone). Blood pressure may drop unexpectedly and cause fainting or dizziness if aspirin is taken along with nitroglycerin tablets. Aspirin may also interact with diuretics, diabetes medicines, other nonsteroidal anti-inflammatory drugs (NSAIDs), seizure medications, and steroids. Anyone who is taking these drugs should ask his or her physician whether they can safely take aspirin. "What's the Best Pain Reliever? Depends on Your Pain." Consumer Reports May 1996: 62.
acetylsalicylic acid, a common nonsteroidal antiinflammatory drug used to relieve pain and reduce fever, and specifically prescribed for rheumatic and arthritic disorders. See salicylate for adverse reactions and poisoning. Aspirin should not be given to children who have viral infections, because this has been associated with the subsequent development of reye's syndrome. Because it interferes with platelet aggregation, aspirin has some value in the treatment of clotting disorders. It is given as a prophylactic measure to patients at risk for myocardial infarction or stroke syndrome and to those at risk of thromboembolism after certain surgical procedures. Administered orally or rectally. Reduces pain and inflammation by inhibiting prostaglandin production. Fever reduction mechanism unknown; may be linked to decrease in endogenous pyrogens in hypothalamus resulting from prostaglandin inhibition. Exerts antiplatelet effect by inhibiting synthesis of prostacyclin and thromboxane A2. Adults: 325 to 500 mg P.O. 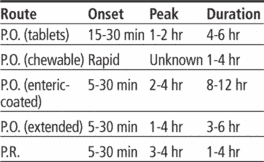 q 3 hours, or 325 to 650 mg P.O. q 4 hours, or 650 to 1,000 mg P.O. q 6 hours, to a maximum dosage of 4,000 mg/day. 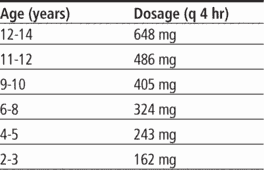 Extended-release tablets-650 mg to 1,300 mg q 8 hours, not to exceed 3,900 mg/day; or 800 mg q 12 hours. Children: 10 to 15 mg/kg P.O. or P.R. q 4 hours, not to exceed total daily dosage of 3.6 g, or up to 60 to 80 mg/kg/day. See chart below. Adults: Initially, 2,400 to 3,600 mg P.O. daily in divided doses. Dosage may be increased by 325 to 1,200 mg daily at intervals of at least 1 week. Usual maintenance dosage is 3.6 to 5.4 g/day P.O. in divided doses, to a maximum dosage of 6 g/day. Children: 60 to 130 mg/kg/day P.O. in children weighing 25 kg (55 lb) or less, or 2,400 to 3,600 mg P.O. daily in children weighing more than 25 kg P.O. ; give in divided doses q 6 to 8 hours. Adults: 650 mg P.O. b.i.d. or 325 mg P.O. q.i.d. Adults: 75 to 325 mg/day P.O. Children: Initially during acute febrile period, 80 to 180 mg/kg/day P.O. in four divided doses. Maintenance dosage is 3 to 10 mg/kg/day given as a single dose for up to 8 weeks or until platelet count and erythrocyte sedimentation rate return to normal. ☞ Never administer to child or adolescent who has signs or symptoms of chickenpox or flulike illness. ☞ Don't give within 6 weeks after administration of live varicella virus vaccine, because of risk of Reye's syndrome. • Give with food or large amounts of water or milk to minimize GI irritation. • Know that extended-release and enteric-coated forms are best for long-term therapy. • Be aware that aspirin should be discontinued at least 1 week before surgery because it may inhibit platelet aggregation. ☞ Watch for signs and symptoms of hypersensitivity and other adverse reactions, especially bleeding tendency. • Stay alert for signs and symptoms of acute toxicity, such as diplopia, ECG abnormalities, generalized seizures, hallucinations, hyperthermia, oliguria, acute renal failure, incoherent speech, irritability, restlessness, tremor, vertigo, confusion, disorientation, mania, lethargy, laryngeal edema, anaphylaxis, and coma. • Monitor elderly patients carefully because they're at greater risk for salicylate toxicity. • With prolonged therapy, frequently assess hemoglobin, hematocrit, International Normalized Ratio, and kidney function test results. • Check salicylate blood levels frequently. • Evaluate patient for signs and symptoms of ototoxicity (hearing loss, tinnitus, ataxia, and vertigo). • Tell patient to report ototoxicity symptoms, unusual bleeding, and bruising. • Caution patient to avoid activities that may cause injury. Advise him to use soft toothbrush and electric razor to avoid gum and skin injury. • Instruct patient to tell all prescribers he's taking the drug, because it may cause serious interactions with many common medications. • Tell patient not to take other over-the-counter preparations containing aspirin. • As appropriate, review all other significant and life-threatening adverse reactions and interactions, especially those related to the drugs, tests, foods, herbs, and behaviors mentioned above. A widely used analgesic, antipyretic, and antiinflammatory agent; also used as an antiplatelet agent. Although a generic in the U.S., aspirin remains a proprietary name in other countries. /as·pi·rin/ (as´pĭ-rin) acetylsalicylic acid, a nonsteroidal antiinflammatory drug having analgesic, antipyretic, antiinflammatory, and antirheumatic activity; also an inhibitor of platelet aggregation. 1. A white, crystalline compound, C9H8O4, derived from salicylic acid and commonly used in tablet form to relieve pain and reduce fever and inflammation. It is also used as an antiplatelet agent. Also called acetylsalicylic acid. 2. A tablet of aspirin. an analgesic, antipyretic, and antiinflammatory. Also called acetylsalicylic acid. indications It is prescribed to reduce fever and relieve pain and inflammation. contraindications Bleeding disorders, peptic ulcer, pregnancy, concomitant use of anticoagulants, or known hypersensitivity to salicylates prohibit its use. adverse effects Among the most serious adverse reactions are ulcers, occult bleeding, clotting defects, renal toxicities, tinnitus, dyspepsia, and allergic reactions. Reye's syndrome has been associated with aspirin use in children. Acetylsalicylate, acetylsalicylic acid Therapeutics A widely used analgesic, antipyretic, antiinflammatory, and antiplatelet agent; it is one of the safest drugs currently prescribed Adverse effects GI upset, occult bleeding; high doses inhibit cyclooxygenase and can produce tinnitus, tachycardia, dizziness, deep rapid breathing, hallucinations, convulsions, coma Used for Pain, fever, rheumatic complaints; acute rheumatic fever; TIAs, acute MI. See Controlled-release aspirin, NSAID, Superaspirin. A widely usedanalgesic, antipyretic, and antiinflammatory agent; also used as an antiplatelet agent. Although a generic in the U.S., aspirin remains a proprietary name in other countries. Also called acetylsalicylic acid. Acetylsalicylic acid. A drug used as a painkiller, to reduce fever, as an antiplatelet agent to reduce the tendency of blood to clot within the circulation, and as a means of reducing the likelihood of heart attack, stroke, diabetic retinopathy, migraine and colon cancer. Aspirin is an inhibitor of the cyclo-oxygenase (COX) class of enzymes which form PROSTAGLANDINs. This accounts for the wide range of its actions. Daily aspirin is recommended for people at risk of coronary events, and complications commonly have been shown often to arise in those on long-term aspirin who stop the therapy for any reason. Aspirin also has a growing reputation as an anticancer drug possibly by its action in promoting apoptosis (cell suicide) in cancer cells. There is some evidence that aspirin may reduce the risk of developing ALZHEIMER'S DISEASE. There is no doubt that it reduces the risk of demential caused by repetitive small episodes of brain damage by thrombosis. See also CYCLO-OXYGENASE and COX-2 INHIBITORS. an analgesic that relieves pain without loss of consciousness. A widely used analgesic, antipyretic, and antiinflammatory agent; also used as an antiplatelet agent. uses: mild to moderate pain or fever. It was the first discovered member of the class of drugs known as nonsteroidal antiinflammatory drugs (NSAIDs), not all of which are salicylates, although they all have similar effects and a similar action mechanism. Its primary undesirable side effects, especially in stronger doses, are gastrointestinal distress (including ulcers and stomach bleeding) and tinnitus. Another side effect, due to its anticoagulant properties, is increased bleeding. n a pharmaceutical preparation used as an analgesic. acetylsalicylic acid, a common drug generally used to relieve pain and reduce fever. occurs in dogs and cats, either from accidental ingestion or inappropriate therapeutic doses. The cat is particularly susceptible because of its limited ability to form glucaronide conjugates. Clinical signs are of a hemorrhagic gastritis, hyperexcitability and metabolic acidosis. Q. Is it safe to take aspirin during pregnancy? I have been having headaches and want to take an aspirin to relieve the pain however I am pregnant. Can I take aspirin whilst pregnant? just one is safe and willl lessen headache pain.